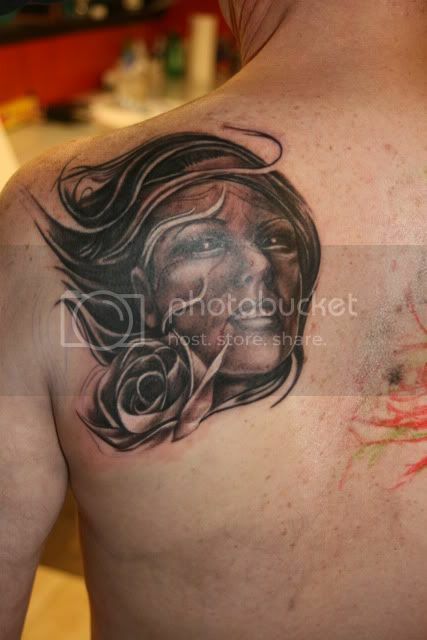 First and foremost let me say Thank You Tony for work that will never show up on the Bad Tattoo thread unless it is a "here is how you do it". 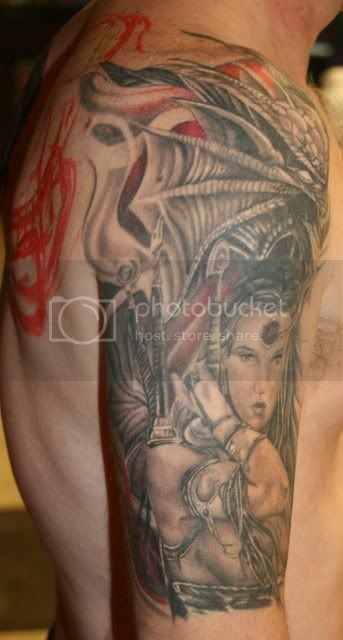 I liked the experience and cover-up on my arm so much I decided to have the inside of my upper arm done too. While we were talking about what to do I was describing a piece of art I really liked. He knew the piece and found a picture of it I had never seen. Long story short... he is doing an original piece to finish the arm and he is going to do his interpretation of the other piece across my back. No pics for now. I want it to be finished and healed first. Sounds incredible! Can't wait to see it! And although I do post "Work In Progress"
We start my back tomorrow. I'm going to take my camera and see if Short, Dave or someone will take a few pics along the way for me. I'll see if I can get them to get a couple of shots of my arm too, it healed up nice. I hope to post a few pics Sunday. Sunday came and went! PICTURE TIME!!! I've got em, but they are huge. Tony is working on putting them on his MySpace. If I can figure out how to shrink 'em I put some up. Upload them to photobucket. It has an option to resize them for you, and then gives you the link to post here so you don't even have to type in the code. You can also open them in paint and then edit the attributes by clicking Image > Attributes. Photobucket is faster, though. Buffer thanks for the help! Still have a lot to do and the idea is a work in progress, but you can see where we are going. Forgot to take the underside of the arm, we'll get it later. Last edited by GaRoadHog; 10-26-2009 at 09:26 PM..